After being kicked out of Hawkwind, due to an addiction to amphetamines, Lemmy decided to start a good honest rock band who played everything louder than anyone else. This band was Motörhead, and they have been playing rock ‘n’ roll for over 35 years. That was your introduction to Motorhead in case you have been living under a rock or a young kid just discovering Motorhead. 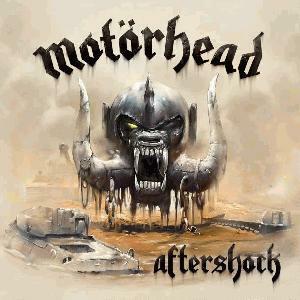 In that case WELCOME, Aftershock is another solid album by this line-up, together since the ealy 90's if I recall correctly. Phil Campbell pulls the riffs & shedding. Mickey Dee does the excellent drumming. If you're NEW to Motorhead do yourself a favor and get a copy of Ace of Spades, Rock and Roll, Bomber, etc. This album is for the old timers that appreciate Lemmy and his craft because we know he might not be around much longer. Rock and roll, wisky, loose women and touring will catch up with you eventually. Nothing new here just good old rock and roll. Great new songs like ‘Long Women Blues’ are among the best, and towards the end Motörhead sound more aggressive and even louder. ‘Queen of the Damned’ is a short and powerful rocker and ‘Keep your Powder Dry’ is one of the best heavy rockers that Motörhead have released this side of the 90s. Lemmy might be getting old and his moles might be getting bigger, but this metal God is far from retiring. His whiskey and nicotine soaked voice sounds more or less the same now as it did thirty years ago. He is still going strong and Aftershock is testament to that fact. Whilst there might be nothing on the album that truly stands out amongst the masses of work that is Motörhead. Lemmy is more than certainly going to die in the saddle. Pick up your copy at a store near you. Enjoy!